Patrick Altree, a San Francisco-based SkyWest captain, first noticed that something was amiss when his right hand would tremble slightly as he was trying to hold something steady, like pouring a can of soda into a glass. He dismissed it as stress or caffeine since it would come and go. But as the problem began to occur more frequently over the next year, he and his girlfriend (now his wife) started a voyage of self-diagnosis. While all the signs pointed to Parkinson ’s disease, Patrick continued to dismiss the idea. Patrick went through a series of tests he refers to as the “Parkinson’s Field Sobriety” where a patient is asked to walk, open and close their hands, recite the months of the year backwards, touch their fingers to their nose, etc. 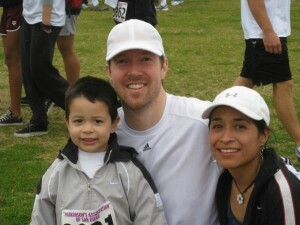 Based on the results, Patrick was diagnosed with Young Onset Parkinson’s at the age of 38. Since being diagnosed six and a half years ago, he has refused to sit on the sidelines and has taken an active role in learning more about the disease and is raising funds to bring awareness to and find a cure for Parkinson’s. Every April during Parkinson’s Awareness Month, Patrick heads up Team SkyWest in the Paws for Parkinson’s 5k in San Diego. 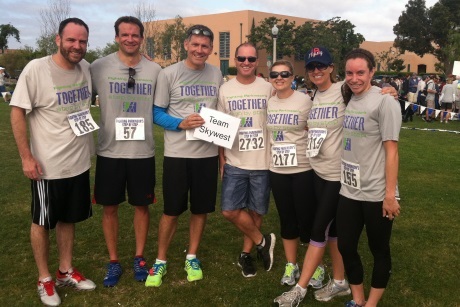 To date, Patrick’s SkyWest team has raised nearly $20,000 for Parkinson’s related research and has become one of the top 10 teams in terms of total money donated. Parkinson’s patients are often diagnosed when they’re in their 60s. Patrick’s battle with Parkinson’s began when he was in his 30s and illustrates how the disease can affect anyone. Fortunately for Patrick, he responds well to the only FAA-approved treatment using a drug called L-DOPA. 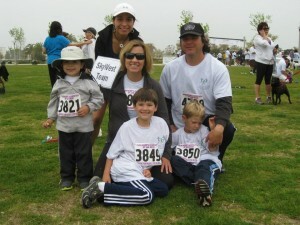 This medication, coupled with running and a good diet, has kept Patrick relatively stable. Patrick’s fundraising efforts support Parkinson’s research, including determining what causes Parkinson’s and how to prevent the disease, developing new treatments and eventually finding a cure. The next Paws for Parkinson’s 5K will be held on Saturday, April 16 at Liberty Station Park in San Diego, right next to San Diego Lindbergh Field. You can also learn more by visiting Patrick’s team page here.